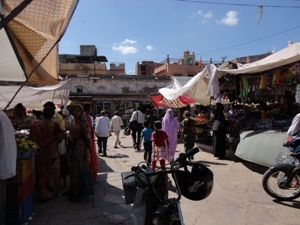 After a busy morning of sightseeing and lunch at Mehrangarh Fort in Jodhpur, we headed down the winding road to the city to explore Sadar Market. 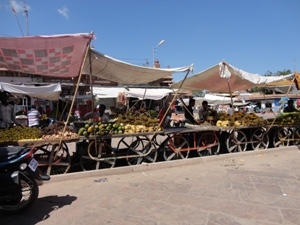 Sadar Market is a large open market and collection of shops where you can find vegetables, spices, cloth, and lots of crafts. 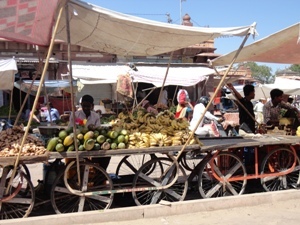 Although the locals come here to buy vegetables and spices, the majority of the shops cater to tourists and sell poor-quality clothes, trinkets, and wood-carved deities. 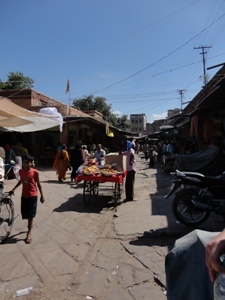 We enjoyed the sights and sounds of the market, although it could be quite chaotic at times with motorbikes and cars speeding around. We wandered around the markets for a while, and then stopped for a special saffron lassi (yogurt drink) at the lassi shop called Shri Mishrilal in the clock tower. It was an interesting place: the tiny little shop was lined with seating and some tables, and a waiter walked around with several lassis for anyone who wanted one. There was no menu, just one kind of lassi. The shop was extremely popular so Rob decided to try one. It was topped with whipped cream, which made him a little nervous, but we decided that the place had such high turnover that it was probably ok (and it was recommended quite highly by our guidebooks). After that we walked up and down the nearby streets, popping into stores to look at the wares and trying to avoid the hawkers that lined the sidewalks. At some point we found our driver, who followed us into a store or two. We asked him to go away because drivers get a commission for bringing tourists into shops, and we would get charged 30-40% more on anything we bought. We knew this already from reading the guidebooks, but a few shop owners took it upon themselves to let us know that this was indeed the case. The markets were a little disappointing because the quality of the goods (even the spices and tea) didn’t seem very high, so we didn’t buy anything. 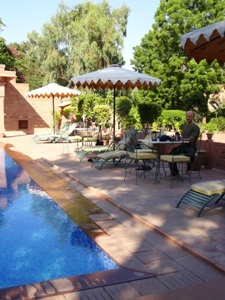 We decided to go back to our hotel for a tea break before heading out again to see the Umaid Bhawan Palace. 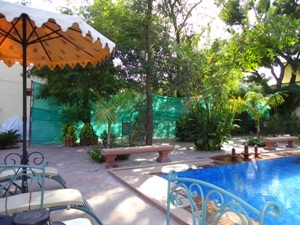 We felt a little funny about sitting by the side of the pool on our India vacation – it seemed like a terrible touristy thing to do – but we enjoyed the break from the chaos of the markets and the hot sun. 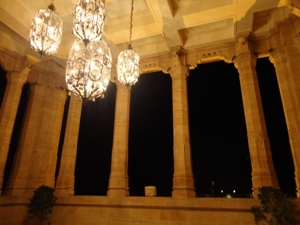 When we had recovered a little, we headed to the Umaid Bhawan Palace to see a small museum on the palace grounds before dinner. The museum was only a few rooms, and it was pretty lame as far as museums in India go. 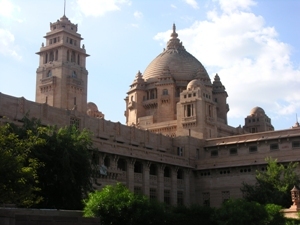 Umaid Bhawan Palace is a 347-room palace that was completed in 1943, and which has served as the principal residence of the Jodhpur royal family. 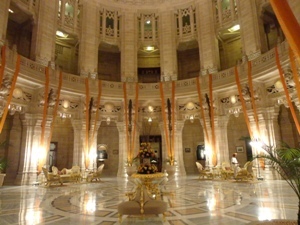 As of 2005, it was acquired by the Taj hotel chain and it is now a very, very expensive luxury hotel (rooms start at around $1000/night). Non-guests are not allowed in the hotel unless they have a dinner reservation – which we did. Although it was a bit early for dinner, we convinced our driver to drop us off at the palace hotel so we could look around and relax a little. He didn’t think they would let us in early, but they did! 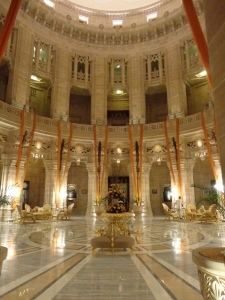 The palace was amazingly luxurious on the inside, and the air conditioning felt great. We wandered around for a while and admired the opulence of the main rotunda. The staff thought we were guests there, so we got a tour of the spa and indoor pool (which had gorgeous tiling), and the gym. 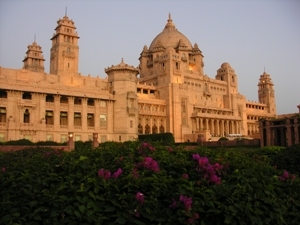 We walked around the extensive gardens outside and admired the size and beauty of the palace. In the middle of the gardens, a private dinner for some VIP was taking place with several servants in attendance, and we had to be careful not to walk to close since they were guarded. We also found a guest services room where there was a Mac (!!!) with pretty fast internet. It was the only computer like this we were to find in India. We were very glad we had come over early for dinner. While we were waiting for the restaurant to open, we spent some time relaxing in the bar, drinking wine and eating mezze (middle eastern tapas plate). When the restaurant, Risala, opened at 7pm or so (restaurants open late in India), we went immediately to get started on what was to be our most expensive dinner in India, nearly $200. The service at dinner was excellent, which was in part because we were one of two tables that were dining at that time. The hotel seemed awfully deserted in general, and we saw few other people while we were there. The presentation of the food was quite nice but it actually wasn’t that good. We started with a pea cake appetizer, which tasted a lot like the Dr. Praeger’s veggie burgers that we buy at home. Then we had a lamb laal maas curry dish (their speciality). It was ok, but the lamb was a little tough. The naan was ok, and I vaguely remember some kind of chocolate dessert. All in all, it was mediocre, and we paid mostly for the luxury of the hotel. While we were dining, fireworks went off outside. We rushed to the window to look, and we were told that the VIP we had seen outside had arranged the fireworks for his special dinner. When we were done eating, our driver came to pick us up and take us back to our hotel. We were a little sad to leave the luxury of the hotel, especially the computer with the fast internet. We went to bed relatively early, since we were leaving the next morning to drive to Jaisalmer city, which is about 5-6 hours from Jodhpur. 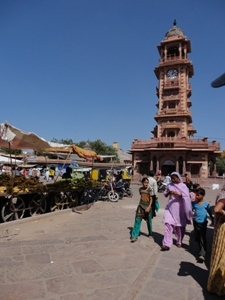 We’d seen pretty much everything there is to see (for tourists) in Jodhpur, and we were excited about heading far west to the desert. We are a couple from Cambridge, MA who are planning our honeymoon in India in Fall 2011.